My grandmother gave my kiddos a book about monsters. This is the card we made to thank her for the book. Extra Details: I began by stamping all of the images in Versa Fine ink. I clear embossed the images to speed up the drying process. I used Crayola Fine Line Markers and a water brush to water color all of the images. I die cut a stitched rectangle from some water color paper. I used the same markers to splatter the water color panel. I colored the markers on my acrylic block and used a wet paint brush to flick the ink onto the panel. 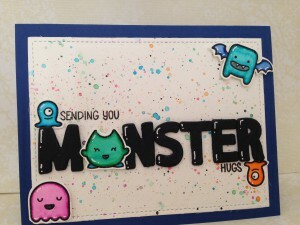 I glued to some black fun foam to some black cardstock and die cut the letters for the word “monster.” I stamped the rest of the sentiment on the water color panel before adhering the letters for “monster.” I used one of the monster images for the letter “O.” I adhered the rest of the monsters around the sentiment. 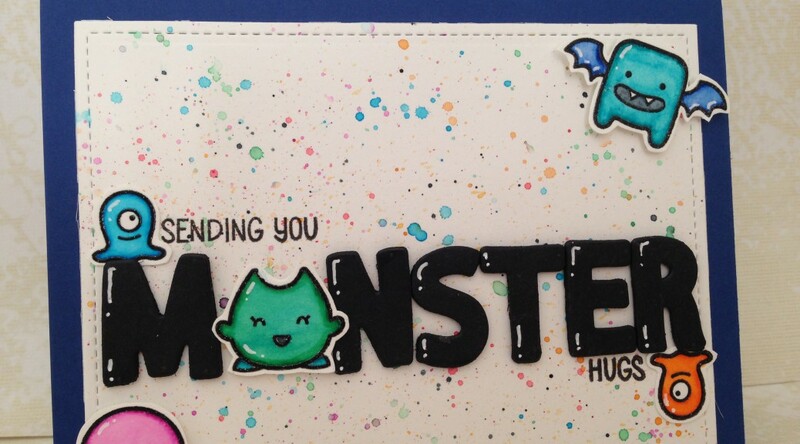 I used a white gel pen to add some details to the monsters and the die cut letters. I created a dark blue card base. I adhered the water color panel to the front. I added a white liner to the inside. I stamped the liner with the School House Backdrops so that my kiddos would have lines to write on. I added two left over monsters to the inside and the card was complete. Fabulous card Rebecca Lynn! 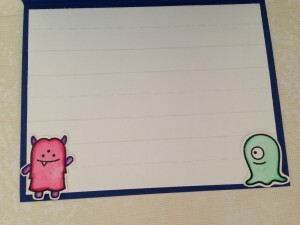 The monsters are super cute and the splatters look wonderful.